Train services were severely disrupted across West Bengal because of fog and blockades by tribal organisations across the state. Thousands of passengers were stranded for hours, mostly at railway stations. Many were scrambling for food and water as the wait was indefinite. From early morning, the Jharkhand Disham Party blocked roads and rail lines in the Malda-North Dinajpur sector, paralysing trains to and from north Bengal. 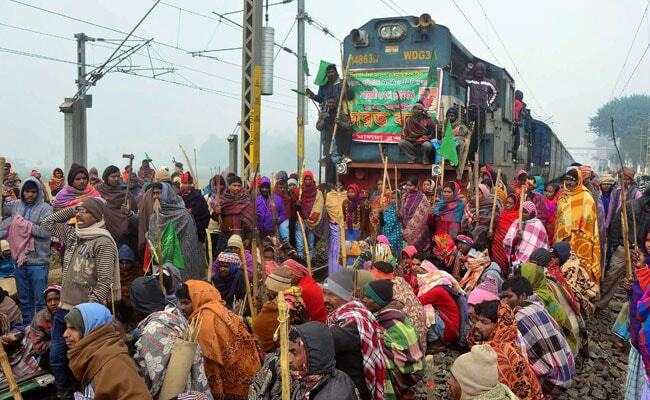 They also blocked trains on the Bengal-Jharkhand border in Purulia and East Burdwan districts. The tribals were protesting against changes made in 2016 to land laws that allow non-tribals to buy tribal land in Jharkhand. However, no such changes have been made to land laws in West Bengal but the state was hit too. Major trains from Kolkata to north Bengal, including Padatik Express and Darjeeling Mail, were held up at Malda and the Kolkata-bound Shatabdi Express were stopped at Kishanganj in Bihar. While Eastern Railway services were worst hit by the blockades, Northern Railway services were thrown out of schedule by fog. Some trains were cancelled because corresponding trains were hours late. Because of the tribal protests, trains bound for Assam were also hit.